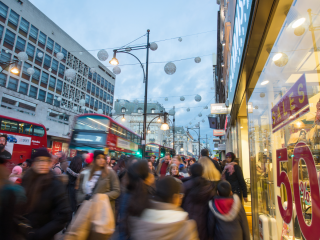 At first glance, the latest UK retail sales data appear to escape the effect of the ‘Beast from the East’, a spell of very cold weather towards the end of February, relatively unscathed. That said, sales of food drove much of the resilience. With overall retail sales growing at just 1.1% year-on-year (excl. fuel), it appears that consumers are still holding back on non-essential purchases. This echoes what the data from the British Retail Consortium and Visa has been saying, with both pointing to a further slowdown in spending. In theory, though, prospects should improve for retailers over the next few months. Inflation is beginning to ease now that prices have more-or-less adjusted to the new value of the pound, while wage growth has shown a surprising amount of energy of late. But while the combination of these two factors means the spending squeeze has passed its worst, incomes in real terms don’t look set to rise meaningfully anytime soon. Partly with this in mind, consumer confidence remains stubbornly low (not far off the Brexit lows), which is particularly stark when compared to Europe and the US, where shoppers are the most optimistic they’ve been since the early-2000s. But while this will keep the brakes on growth this year, the Bank of England will be focussed squarely on wage growth as they meet today. The combination of faster momentum in earnings, and the Brexit progress made this week, makes a May rate hike look more and more likely. We may get some subtle hints of this today, although, with markets largely on-board with the idea, we are unlikely to see any explicit rate hike signals of the likes we saw last September ahead of the November rate hike.